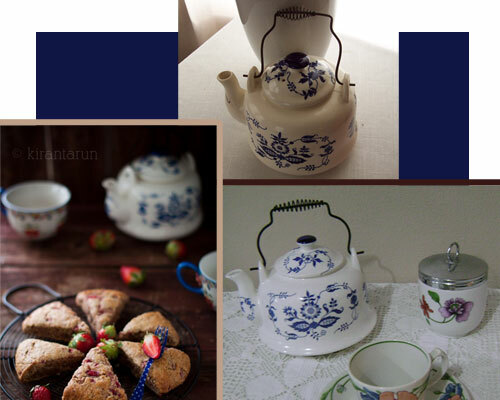 If you spend quite a bit of time online, especially on social media sites following some of your fave companies (like the owners of this blog), sooner or later you’re going to see a photo of some teapot just like one you own. It happened to me the other day and was significant in part because the teapot was not one that you see a lot of. Other teapot patterns are quite popular and thus pop up just about everywhere: Pinterest, Twitter, Facebook, Flickr, Tumblr, and many more. And the thrill of seeing a teapot like one you have being posted on one of these sites can be substantial. My teapot says “Made in Japan” on the bottom, is at least 20 years old (since that’s how long I’ve had it), and the glaze is crackling a bit. I don’t use it anymore but just have it up on display. These others are slightly different in the designs painted on them, in their spout shapes, and in the body shapes. It was still quite a thrill to see them online – sort of a real connection with the folks who had posted these. A classic and very popular pattern is Royal Albert Old Country Roses Teapot. It keeps showing up all over. Here are a couple of images we found plus the official image on many store sites. A great tea room always uses great teawares! The Four Seasons Tea Room (top left in the photo above) in Sierra Madre, California, sure sets that standards bar high with their table spread with a range of Royal Albert Old Country Roses teawares. A blog article showed this china pattern set up on a table for a real party time. You would almost miss the teapot in the back there, but my sharp eye caught it. Both photos show this pattern “in action” which is quite different from the straight store photo (shown in the above image at top middle). (If you’ve ever gone furniture shopping, you know how different that chair or sofa looks in the showroom versus in your house. The same goes for swimsuits which as a rule look much better on you in that store dressing room than at home or on the beach.) Those of you who own this china pattern, be it one piece or many, can get that thrill of connection, seeing others that have it, too. I guess it’s that “great minds think alike” attitude that gives you that bit of a thrill. Cool!